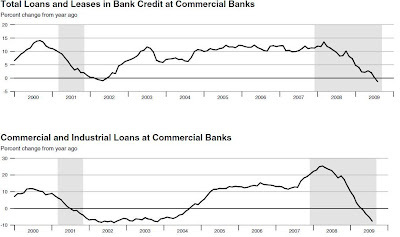 Total Loans and Leases at Commercial Banks as well as Commercial and Industrial Loans are in NEGATIVE territory. 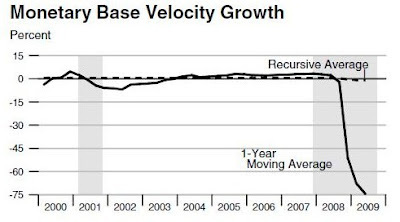 This is what the Fed is attempting to fight by forcing more money into the system. 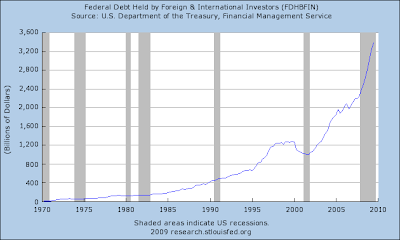 The reason the money pumping doesn’t go anywhere is that the entire financial system is saturated with debt. Those who underestimate the importance of consumer credit are destined to repeat the same mistakes as those who believed that subprime would not infect the rest of the economy – that’s because it was a SYMPTOM of a much larger debt and corruption/fraud problem. 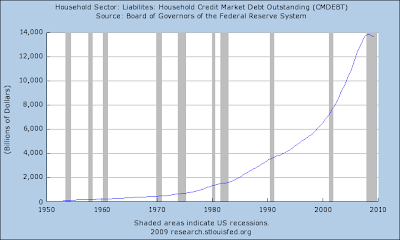 Note the drop in Consumer Credit, it is accelerating downward. 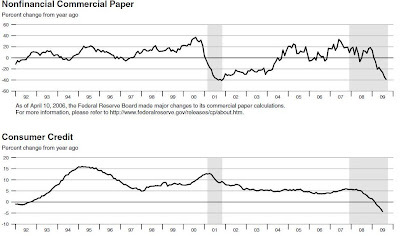 Meanwhile NONFINANCIAL Commercial Paper is collapsing at a MINUS 40% YOY RATE!! 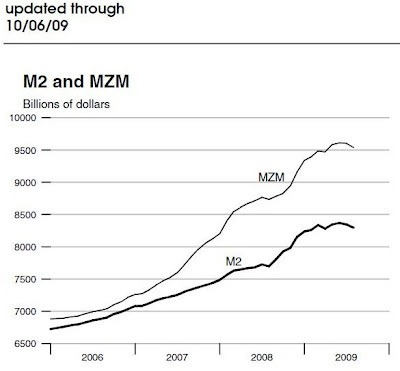 Note the date of that chart, it is current as of this week. Still near 140, the P/E has turned down slightly from the high last month. There are two ways to get this ratio down… one is for the PRICE of stocks to go down, and the other is for earnings to go up. The bulls are arguing that earnings are going to go up while the bears are arguing that the price is going to come down. Reality will almost always be found in the middle, but it will most certainly not be found here at a P/E of 140! David Rosenberg, now at Gluskin & Scheff, just published an outstanding article describing the different price to earnings ratios and the arguments presented by both the bulls and the bears. Anyway you want to measure it, whether it be by looking at hopeful mark-to-fantasy future earnings or by looking at current or trailing earnings, this market is overvalued! I’d like to point out something Rosie didn’t… namely that what earnings we currently show ARE FALSE EARNINGS made primarily on the back of the financial industry and their MARK-TO-FANTASY, Congressionally supported, Corporate money financed, Enron like, TOXIC WASTE, bonus generating, FALSE PROFITS. Hey, you can believe whatever you want and invest your money wherever you please. You can take to the bank, however, that the market WILL return to historical ratios. When does that correction finally begin? Here’s a clue… LQD, the iShares Investment Grade Corporate Bond Fund, has been growing non-stop since the equity market bottomed back in March on a perfect rising trendline. 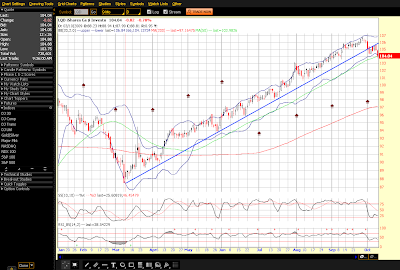 That trendline just broke to the downside meaning higher interest rates. As interest rates rise, the PRICE of bonds fall. This fund grew from $65 in 2002 to over $106 at its peak last week. The Fed has set the Federal Funds rate at zero and has flooded the market with liquidity and quantitative easing to artificially hold rates down. Now Australia and a few other wise countries are beginning to raise rates yet we’re trying to hold fast, after all we need to keep the appearance of a healthy economy up, don’t we? Well, rates will not remain below historic norms forever, that broken trendline is a clue, it is talking to you, are you listening? I’m going to grant you that in the past rising rates have meant that money is flowing out of the bond market and into equities. 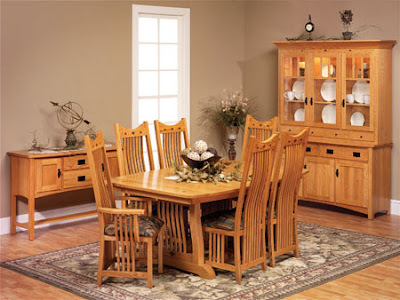 What is different about now from the past? DEBT, that’s what. 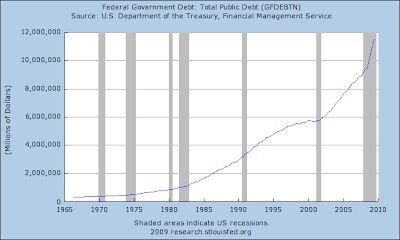 As rates rise with debt saturation, the cost to carry that debt skyrockets. It’s what Bernanke is fighting and it’s a battle that will eventually be lost, there’s no way around it, to include devaluing our money. Ignore historic ratios and broken trendlines at your peril.